Modifying exercise, particularly CrossFit and weightlifting exercises, when pregnant is critical to reducing your risk for peri-partum injury. Its hard to do for sure. We all want to maintain our fitness and remain competitive. But, the priority during and after pregnancy is the safety and health of both baby and mom. Remember, just because you aren’t in pain or you are still capable of performing in the way you did pre-pregnancy, you may be doing yourself a dis-service by setting yourself up for problems down the line, or at the very least some bad habits as you change your motor patterning with various movements. Of course we are not discouraging exercise. In fact, please continue to exercise!! But, just use caution and consider the ways in which you might modify your workouts during your pregnancy. Start at the “hang” positions: Modify the lifts by starting from the hang position when the belly increases in size, as this makes it harder to lower the barbell to the ground. 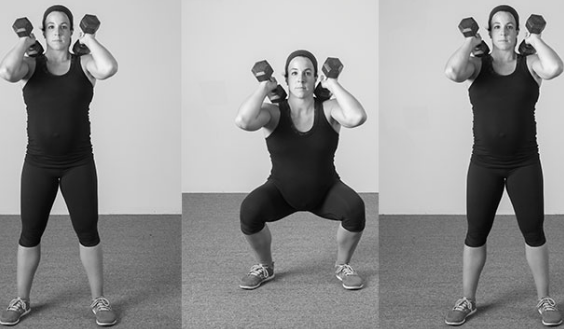 Finish in the “power” position: Often pregnant mamas don’t feel comfortable catching in the squat position. You can still work these barbell movements by catching in power positions. Forego the barbell: Finally, when the size of the pregnant belly starts to change the bar path (ie. you are swinging that weight way out in front to avoid hitting your bump), consider switching to dumbbells or kettlebells for the Olympic lifts. An improper bar path leads to bad habits and can cause injury. The biggest thing to note here is that there is no reason to be doing max efforts when you are pregnant. You are not going to be setting any records and the cost/benefit isn’t worth it. However, that is not to say you shouldn’t be lifting. Just be sure that you are managing breathing and not creating too much pressure with these lifts. You need to be exhaling as you exert effort so as to avoid bearing down into the pelvic floor and abdominals. Kipping motions need to cease after the belly gets a little bigger. In pregnant or postpartum women, diastasis recti is caused by a stretching of the linea alba, the tissue that connects the left and rights halves of the rectus abdominis. This is a very common condition in pregnant women caused by the growing uterus expanding against the abdominal muscles. Please see PART ONE of this blog for more information. This can happen naturally, just by nature of the abdomen growing. However, if you have a weak core or are not properly engaging it during a kipping motion, you might be making the condition worse. And this isn’t necessarily that you aren’t skilled enough to do it, but rather that your core is stretched out (thanks baby!) and unable to contract appropriately after a certain point. You are risking over-stretching that core. Toes-to-bar and knees-to-elbow need to take a back seat. Perform Russian swings with a kettlebell if you want a metabolic stimulus and planks if you want a core stimulus. The ability to kip will return. You aren’t losing out on anything. This is not worth the risk. Muscles ups: same as above. Let’s stay strict and no Valsalva maneuver. You want to avoid pressure bearing down on the pelvic floor more than your baseline as a pregnant mama. If these modifications are out of reach, you can practice muscle-up transitions from toes or using a band. You can also modify with jumping muscle-ups (stick to ring as you won’t want your belly to hit that bar). There was a great social media post by @christyphillipsadkins regarding this. You can view it here. If you cannot feel your abs engaging, chances are that they aren’t. You can try side planks perhaps or planks on an elevated surface. At some point, you might just cut them out of your program. If you have somewhat of a belly, please don’t do burpees. Step out to a plank and back up. You can also do an incline push up using a bench, plates or boxes. If you are adding a jump over a barbell or other apparatus consider stepping over to avoid a potential fall and to minimize the impact through the pelvis. If burpees lead to incontinence or an “urge sensation”, modify. Please see PART THREE of this blog for more information on returning to and modifying exercise after baby comes AS WELL AS a list of helpful resources.